Complete kit to aid in building a role-playing game to suit your own particular needs. Publisher's blurb: "Ever wanted to write your own RPG but not known how to start? 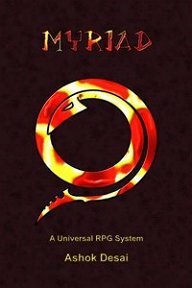 Myriad is a rules-light modular role-playing system that can be readily adapted to any genre and setting. Myriad is not an RPG in its own right, moreover it is a toolbox with which to construct the game of your dreams. Inside you will find a complete simple system that, in its purest form, can be picked up and played in a matter of minutes and a whole host of tips and tricks to help you twist it to your own evil schemes. You will also find a veritable cornucopia of optional rules, resources and modules to slot in as you require them, from romance to vehicle chases, from fist fighting to fear effects, from magic to political wrangling. Just select the ingredients you like and discard the ones you don't."